Werneuchen coppersmith Eberhard Müller created this metal version of the CCS logo. For almost five decades, America’s commitment to Berlin was central in developing the close bond of friendship between Germans and Americans. With the withdrawal of American troops from the city, Berliners were determined to continue to strengthen their unique ties to the country that had done so much for them. To this end, the Berlin legislature passed an act in 1994 creating a foundation and entrusting it with the responsibility to foster German-American relations in Berlin. The legislature gave the foundation an endowment and chose to name it after the former Berlin border crossing that had become a symbol for the American presence in Berlin during the Cold War. The Checkpoint Charlie Foundation was born. The Checkpoint Charlie Foundation is a registered non-profit foundation incorporated in the state of Berlin under its laws. The purpose of the foundation is to foster German-American relations with special consideration for the role that the U.S. played in Berlin between the years of 1945 and 1994. Since its establishment, the foundation has planned, supported and implemented 730 German-American projects, funding them with more than 2,13 million Euros. In addition, the foundation has coordinated the largest German-American teachers’ exchange between the U.S. and Germany and has overseen quite a few of Berlin’s non-partisan activities with its sister city Los Angeles. Together with the American Association of Teachers of German (AATG), the foundation established the Checkpoint Charlie Travel Grant to fund study trips to both Berlin and Germany by exceptional American teachers of German. Finally, following the terrorist attacks of September 11th, the foundation used more than 1.1. million DM ($930,000) donated by the German people to establish the City of Berlin Scholarship, for the children of first responders killed or injured on September 11th. The foundation is a non-partisan institution. 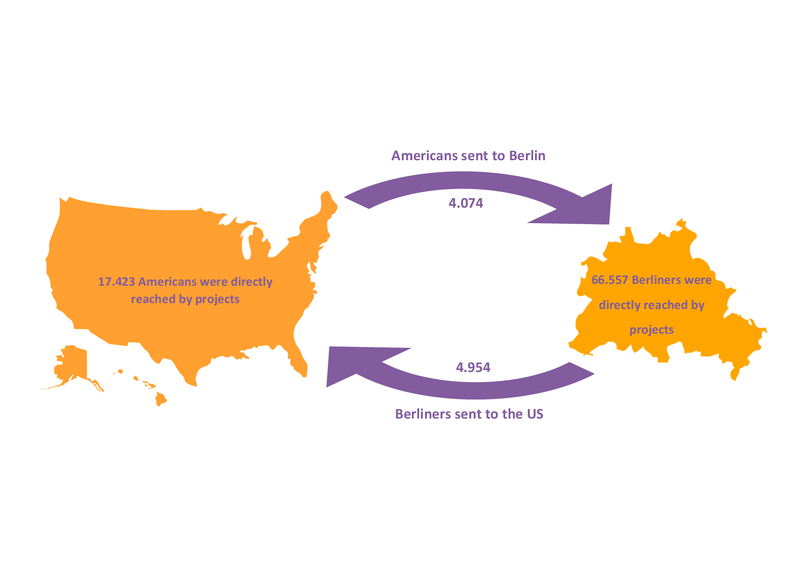 Between 1994 and 2018, projects funded by the foundation have reached more than 96,000 people in Berlin and the USA.